Bankruptcy, court ordered contractual realignment, is what happens when business expenses exceed a business’s intake and the business or city is either unable or unwilling to cut labor costs. Connecticut’s Capital City, union bedeviled Hartford, was on the point of bankruptcy some time ago, but the city was “saved” from bankruptcy when the Democrat dominated General Assembly bailed it out with an infusion of state tax funds. The half a billion dollar bailout simply saved city Democrats and Mayor Luke Bronin, once Governor Dannel Malloy’s Chief Counsel, the necessity of trimming labor costs. And so – the false “solution,” the tax bailout, moved the problem into the future, where it will no doubt be revisited by a future Democrat dominated City Council begging the state for bailout dollars. In ordinary, common sense parlance, this is called NOT SOLVING THE PROBLEM. The state of Connecticut is experiencing the very same economic dilemma. The revenue brought into state coffers through tax increases is not sufficient – and will never be sufficient – to cover labor costs. The only way to permanently settle the labor cost problem is to reduce the cost of labor, an unpalatable solution for progressive state legislators who owe their election to office to state workers’ tireless efforts to support their campaigns. “A Message From Your AFSCME Council 4 Union” distributed to about 30,000 rank and file members connects the political dots in the governor’s race. 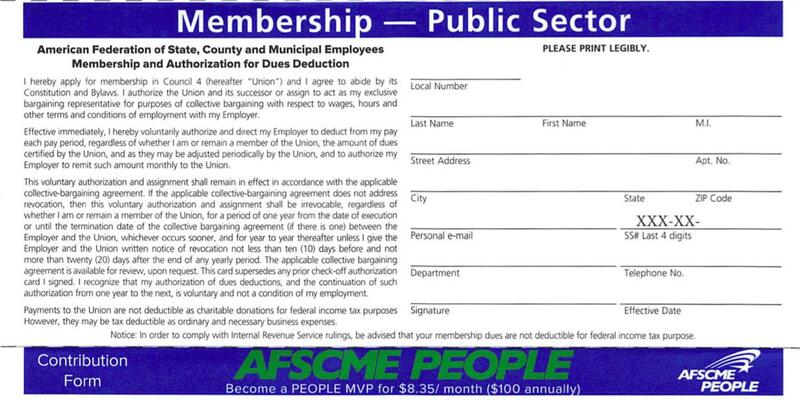 Lamont is “fighting for working people” by defending the rights of unionized state employees, an ever growing portion of “all working people who cannot tap into tax dollars.” Though it may not be clear from the union-fee generated political brochure, Lamont is fighting for tax consuming “working people” at the expense of tax paying “working people. “Lamont thinks Connecticut retirees, teachers and state workers should not be blamed for the failure of past governors and legislators to fund pension and health liabilities.” But the Democrat Party in the General Assembly -- with the sufferance of SEBAC, the union conglomerate charged with striking contracts written in judicial stone between governors and union heads – has controlled state workers’ pensions and salaries for the last three decades and more. 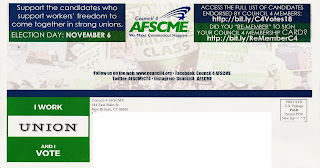 Yet AFSCME is not recommending that its rank and file members should vote against Democrat legislators. On the contrary, a vote for Lamont is a vote for the continuation of the policies, beneficial for state workers, of the Malloy administration – and a vote against “structural changes,” the real remedy to the pro-union budget busting benefits encoded in the contracts signed by Malloy and SEBAC. The terms of those contracts -- which include automatic salary and pension raises -- will be carried forward through a possible Lamont administration until they expire in 2017. Salary and pension increases, tax payers who do not work for the state should understand, represent a tax increase for them. This is governing on auto pilot; because contracts are affirmed in negotiations between Governors and union leaders, only an appeal to courts may adjust the terms of the agreements. Republican leaders have been insisting for years that salaries and benefits should be determined legislatively, as is the case in most states. That change, if adopted, would be a structural change that would recover for the General Assembly its constitutional prerogatives, which stipulate that the General Assembly rather than the courts should have directional control over getting and spending. 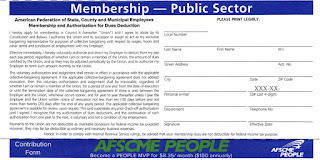 The “Re-Member” card is AFSCME’s answer to a Supreme Court ruling which affirms that state workers who do not wish to belong to unions cannot be punished for their decision by requiring such workers to pay union dues, a portion of which is devoted to producing political mailers that are in effect campaign literature disguised as informational brochures. Sign on the dotted line, forget the wizard of Oz pulling the political strings of bought legislators, climb aboard the Lamont Express, and just shut up.